Become the most feared Sith lord in the galaxy this Halloween when you dress in one of these signature Darth Maul Halloween Costumes. Become the spitting image of the villainous Star Wars character. Whether you need an adult-sized or kid-sized costume, or just an accessory to top off your costume, you'll be sure to find what you need. 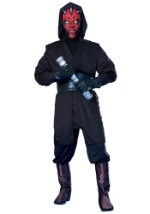 Transform yourself into the Sith lord with this collection of Darth Maul costumes.